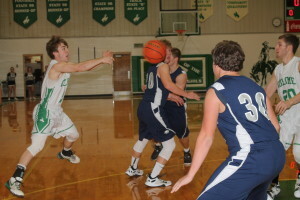 Colome Cowboys defeated Burke/South Central 65-40 on Feb. 16. Reed Harter led the scoring for Colome with 18 points followed by Holden Thieman with 13, Jackson Kinzer, 10 and Will Cahoy, 9. Kinzer and Thieman each pulled down 9 rebounds. Colome had 6 turnovers and 7 fouls in the game.